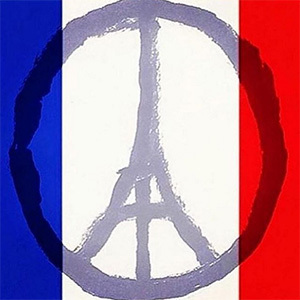 Like many of you, I was shocked and dismayed about the news yesterday out of Paris. It is a heart breaking narrative of anger, hatred, and violence against everyday people going about their everyday lives. And this narrative is becoming all too common. The story is unfolding as I am writing this, so my intention is not to give you an up to date report and response, but rather, a pastoral response to the heartbreak, pain, and suffering. Our natural response is grief – I get angry when I experience loss and pain. It’s my primary stage of grief whether it’s death, job loss, or tragedy. We, as a nation, seem to express our grief similarly, through our anger. We want to know who is to blame, why they did it, and what justice demands. As a nation, we can safely answer the first two questions fairly easily (ISIS and because they’re terrorists). The third question is more difficult. Some of us want to bomb every inch of ground that smells like ISIS has been there. Others want to help other countries get involved and take a secondary role. Still others want to be entirely hands off. I don’t know what the best option is, but I do know that you can’t bomb, shoot, or kill an idea, which is what fuels ISIS. There are no simple answers – We want the solution to this situation, and presumable future occurrences, to come with a simple answer. Life rarely provides us truly black and white options. There are political and humanitarian issues at play in this conflict with ISIS, which is admittedly a much more clear cut conflict than most. Those issues are complex because of a wide range of cultural and social issues that no single person is prepared to really address in a blog post. Above all else, fear must not drive us – Our call, as Christians, is to lead with love. We must not use a rhetoric of anger, vengeance, or fear. This includes towards those who would wish us harm. This tragedy will inevitably be a point in the conversation about the refugee crisis, our response to ISIS, and general foreign policy. Christians are called to love first and always. Our inclination will be to wall ourselves off. We must love the unlovable. We must reach out to those who are hurting, and not look for excuses, reasons, or justification for violence or anger. We cannot let the normal narrative be of hate, violence, and tragedy. We must, rather, change the narrative to one of love and mercy. It’s difficult to love a people whose “idea” of life hates everything good and loving. God has the answers to all our problems, but will we listen? Probably not, because we still tend to repeat the same old history over and over again. When will war and hatred ever end? When will Jesus put an end to all this misery? I don’t have the answers to this horror, but God does, and I need to keep trusting Him.